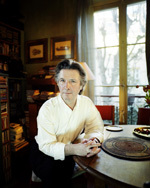 Gilles Anquetil is the chief editor of the prestigious French weekly Le Nouvel Observateur. He has written a sort of essay-report on the Iranian Revolution and a novel entitled "Tout va se jouer", which explores the mysterious aspects of Jazz and improvisation. (Beckett, Boulevard du Montparnasse, Breton rue de Furstenberg) or from his own memories as an extremely younger sibling, of the likes of Georges Dumézil or Vladimir Jankélévitch. The important events of the world also resonate in this book : 9/11, the Iran-Iraq war, without forgetting Afghanistan, starvation and exodus in Ethiopia. Escales is a travel notebook where the author is not seeking exoticism, where he is roving without nostalgia in worlds that are quickly fading away. This is a solemn novel, but it never lacks in joy.